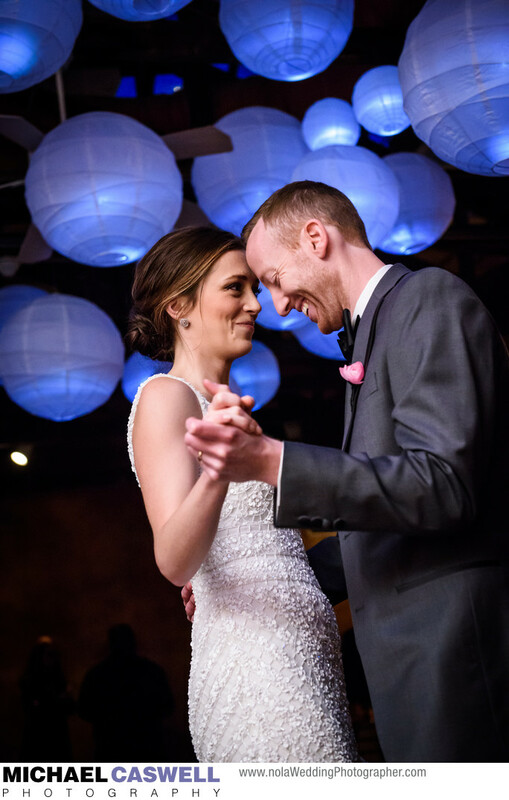 Glowing Chinese lanterns hanging from the exposed ceiling beams make for a visually interesting background as the bride and groom have their fist dance at this Musee Conti wedding reception, which was expertly coordinated by Kelly Sherlock. The Wax Museum, which closed in 2016 to be turned into a condominium development, was a wonderful reception venue, with a warm, rustic look that is very visually appealing and photographs well, and plenty of space for larger weddings. This venue was similar to The Foundry, an also closed facility in the Warehouse District that was a favorite among wedding photographers. If you like the look of the Wax Museum, there are several other reception venues that have some similarities. A few that come to mind are The Chicory, Bourbon Vieux, and Republic NOLA. Also, though the main ballroom of Latrobes has a different look, the courtyard (where ceremonies are typically held) features lots of exposed wood beams and gorgeous textures on the interior walls. Location: 917 Conti St, New Orleans, LA 70112.